A baby Harp Seal, less than a week old, posing for the camera on the pack ice on the Gulf of St. Lawrence in Canada. A white ball of fur that blends in with the pack ice on the Gulf of St. Lawrence in Canada, is a baby Harp Seal waiting for its mother to return. For the first two weeks of its life, a baby Harp Seal will feed off its mother's milk which will fatten it up making its size triple during this short time period. The baby Harp Seal will linger by the holes in the ice waiting for its mother to pop up her head. She recognizes her young, not by the look of her baby, but by the scent, and any others trying to move in will be immediately rejected. After two weeks, the baby Harp Seal is weaned from its mother's milk, the white coat will begin to moult, changing dramatically in color, as it is left to fend for itself. Crying atop the pack ice for the first while, the baby Harp Seal will become sedentary so that it can conserve its body fat. 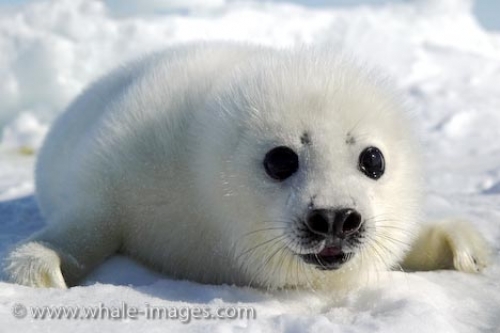 The baby Harp Seal has no teeth when it is born, but they too will rear their heads within the first two weeks. The mother will carry on with her daily life, leave her baby and head back to the Arctic waters for food or find herself being courted by the males. A baby Harp Seal is one of the cutest species of mammals around with its pure snow white fur, big, black, rounded eyes and cute black nose. Most seal pups when born weigh about 10 kilograms, but they do not learn to swim or find themselves any food for the first twenty-five days of life. This can make a baby Harp Seal an easy target for a Polar Bear or humans on the seal hunt. A thirty percent portion of seal pups do not survive even their first year of life. It is not until the age of between five and seven years that the Harp Seal will reach puberty and be able to become a mother. A program called Ice to Protect Seals has been underway for years and celebrities like Heather and Paul McCartney are part of this group along with the Humane Society of the US. Hopes are that Ice to Protect Seals will stop the annual seal hunts which slaughter thousands of these cute babies every year.